On 16 August 1819 an estimated 80,000 people gathered at St Peter’s Fields, on the site of the present Free Trade Hall, to attend a meeting in favour of parliamentary reform. It was a peaceful gathering, but nonetheless local magistrates feared a riot and sent mounted troops wielding sabres to disperse the masses. This they did in a matter of minutes, leaving eleven people dead and over four hundred wounded. 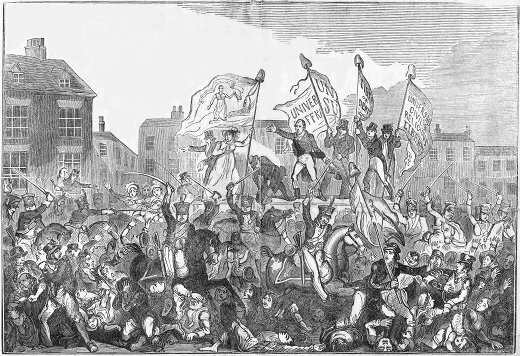 The Peterloo Massacre, as the incident quickly became known, remains one of the most scandalous incidents in Manchester’s history. The Library has a wealth of printed and manuscript material on the massacre. Much of this was collected by the Reverend W.R. Hay (1761-1839), who was one of the magistrates responsible for the massacre. 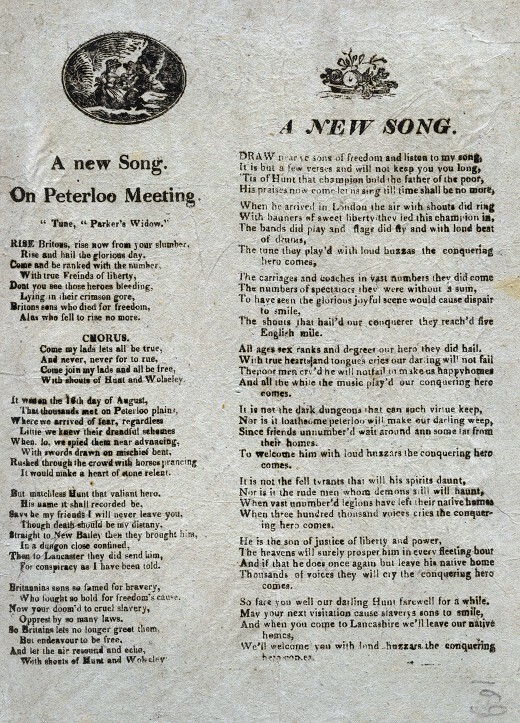 Hay’s collection consists of over four hundred broadsides, commonplace books and other items, many of which relate to Peterloo. The scrapbooks were given to the Library by local historian F.R. Raines. Read more about Hay’s scrapbooks here. 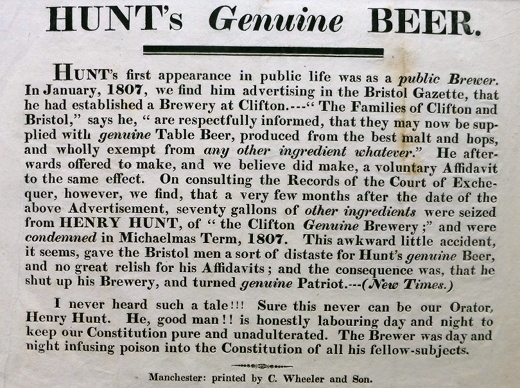 This defamatory notice was intended to tarnish the reputation of Henry ‘Orator’ Hunt, a leading Reformer, who was to address the crowds at St Peter’s Fields on 16 August 1819. The autobiography of James Weatherley, (1794?-1860), a bookseller of Manchester, contains an unpublished eye-witness account of Peterloo. In contrast to the official accounts, Weatherley saw the massacre in personal terms, attributing the main fault to the yeoman trumpeter Meager, who according to Weatherley first began the assault. He records that Meager ‘could never get rest in Manchester after this affair he was annoyed in every place and company in which he went he mostly carried a loaded pistol with him he would as soon shoot a man as a dog…’ Weatherley’s autobiography was acquired by Chetham’s at the sale of James Crossley’s library. A ballad from the Central Library Collection, temporarily housed here at Chetham’s. 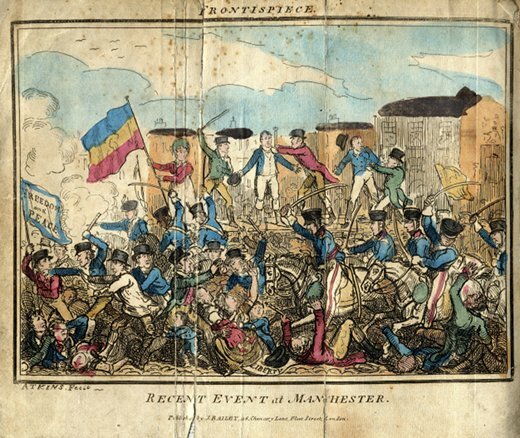 The library’s Peterloo collection includes everything from contemporary printed pamphlets to modern history books. The items collected by William Hay are preserved in the ‘Hay Portfolio’ and 17 scrapbooks. 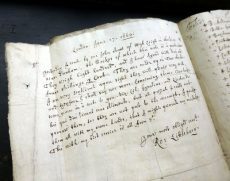 The Hay Portfolio was digitised in 2018 as part of the ‘Ballad of Chetham’s Library’ project, funded by the Arts Council Designation Development Fund and the images are available in our online catalogue. 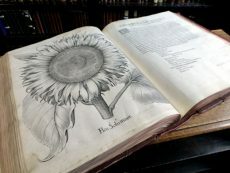 Two of the best scrapbooks were digitised in 2019 thanks to the National Manuscripts Conservation Trust and these images will soon be available, too. To make it easy to find things, when you go to our online catalogue you will see ‘Quick Links to Popular Searches’ on the left-hand side. There is one link for ‘Peterloo’ and another for the ‘Hay Portfolio’. Clicking on the ‘Peterloo’ link will show results for everything in the library related to Peterloo, including modern history books. Clicking on ‘Hay Portfolio’ will show an itemised list of its contents, printed ephemera related to Peterloo, c. 1812-1820. Clicking on an item title will show you a little more information about it, with a hyperlink to one or more jpg images. To go to the online catalogue, click here. Our online images are free for non-commercial use (i.e. Creative Commons licence) with credit to Chetham’s Library; if you post the images on social media, please tag us @chethamslibrary – we always like to see them being shared! If you require print-quality images and/or wish to discuss commercial use, please contact us. For researchers of the early nineteenth century in Manchester, the Leech Family Archive (diaries, letters and ephemera) may also be of interest. Click here to find out more.